"For singles and anyone else learning to be more loving to self and others." 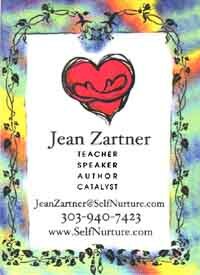 Self-Nurturing Solitaire is a deck of cards designed to improve Self-Esteem. It started out as a small edition between friends, and by building on earlier experiences it has now emerged in a new edition of almost 200 decks, collated and shrink wrapped by CTS Printers. It is illustrated by Idelle Jones with the text written by Jean Zartner. Packs are available directly from Jean Zartner at the price of $15 or $20 including international postage and handling. Payment may be made by Visa or Mastercard. "The deck is probably very different from other decks you review, because they weren't primarily meant to be used as playing cards. Their primary use is for the self-nurturing tips on the backs." Each card has a positive idea printed on the back, designed to help you improve your inner life and become a better person. Idelle's water-colour paintings are bright and youthful, sometimes dreamy, adding a mystical and self-nurturing feel to the pack. The club suit-sign is a four-leafed clover, and the heart symbol is a self-hugging heart. The indices are in a typeface reminiscent of hand lettering which works very well. Nice cards! Very gentle and perfectly balanced - ideal for their purpose. "Speaking of manufacturing faults (compounded by author error), the first run had a typo in the title, and no one caught it until the printer started the second run two months later. It said "Self-Nuturing." Blush! After we caught it, we made a lot of jokes about "self neutering." "I had more title cards printed, and sent them - with an apology letter - to all the original customers. My business coach said that's all part of starting a business. Sigh."